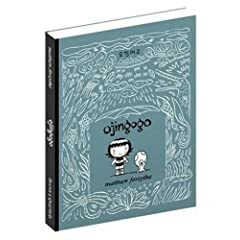 Drawing from Korean influences, Ojingogo is a magical dreamscape of a comic involving a young girl, her squid, and their adventures. With the mostly wordless panels Matthew Forsythe has crafted a story to be enjoyed by all ages. "The black-and-white pencil drawings are fun and bizarre, the tone often reminiscent of the "just accept it" dream-logic of a Miyazaki film (Spirited Away, Howl’s Moving Castle). It’s likely that the majority of the book’s readers will be post-secondary hipsters and comics enthusiasts, but it works perfectly for the tween and teen set." I just tried to think of a few songs that I was listening to around the time I started the comic. I was living in Korea teaching English and at the end of a long, mostly-lonely stretch of traveling. The words "no cities left" were kind of a mantra for me on this trip. I knew Murray and Natalia from the Dears through some friends I had been living with in London and I had a No Cities Left t-shirt I wore everywhere. I had been traveling and working in Europe and Asia for effectively for five years. And there was something about Korea that made me feel like I was finishing something. Strangely can't hear this song without thinking of the strange little room I lived in in Korea. My mattress on the floor, bars on the windows. This song takes me back to Dongdaemun night market in Seoul. Oh Channon basically means 'five bucks' in Korean. For some reason everything costs five bucks in the street markets of Seoul, so you'd be walking around hearing all the old fishmongers shouting, "Oh Channon!" I hate the gloss of over-produced music; so the Mountain Goats' rough, sketchy, poetic songs resonate strongly with me. I like my comics the same way, scratchy - not overlaboured - but with lots of heart. I'm thrilled by how many people connect with Ojingogo despite the fact that it is basically a wordless comic. Sometimes we say a lot more without words.